Green Gummi Army Guys: 5 LBS Army Guys! Ready to fight for the best flavor! Are you ready? 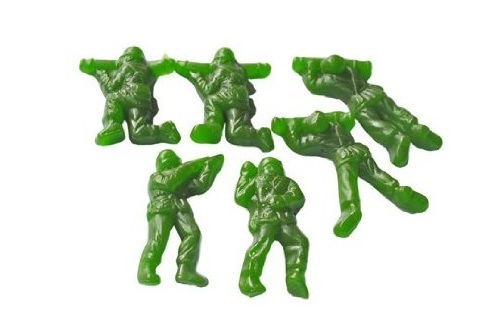 At ease, it's okay to play with your food when it's these gummy candies that look like toy army men. These sour apple gummy candies are just like the little toy figures we all played with as kids. Toy army men gummy candies will come to your rescue when your grown-up self-restraint threatens to win the battle against your inner child's sweet tooth.